In the earlier post Find the most frequent items using SQL, we use "group by" query to calculate the frequency of items and then functions row_number() or dense_rank() to generate rank based on the frequency to pick the top N items. The difference between row_number() or dense_rank() is that row_number() generate unique rank for each row even if there are ties. Now, we want to solve a more sophisticate problem. 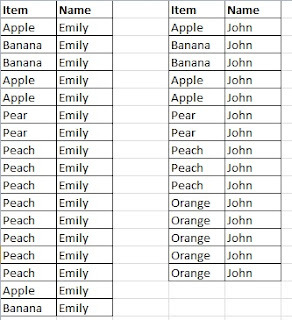 We want to select the top 2 most frequent items in table tbl_items_by_person (shown below) for each person, Emily and John (instead of global top 2 most frequent items). The first step is to calculate the item frequency "group by" name and item. The second step is to use row_number() or dense_rank() to generate rank for each name separately. This is done by using the clause over(partition by name order by num desc). We can pick the top 2 frequent items for Emily and John using the following query. Or, we can use dense_rank() to generate rank which will assign the same rank for ties. For John, there are 3 peaches and Apples. Both of them are ranked as 2. Thus they are both selected as shown below. Let's assume that I would like to see the frequency of each fruit bought. So in the table we have information that people buy fruits. 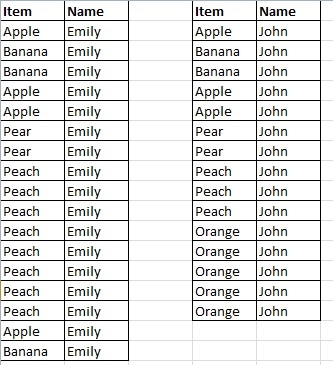 My result table would show that Apple is bought 76% of the people, Peach is bought 45% of the people. Normally, ONE person can buy several fruits, not just one. How can I calculate this?